If you are selling a real estate property in Texas, you must provide the buyer with this Seller's Disclosure Notice, in accordance with Section 5.008 of the Texas Property Code. The form must be completed by the seller and given to the purchaser prior to completing the sale transaction. The condition of the property, including land, utilities, appliances, gas lines, water supply, structural elements, etc, must be disclosed in full. 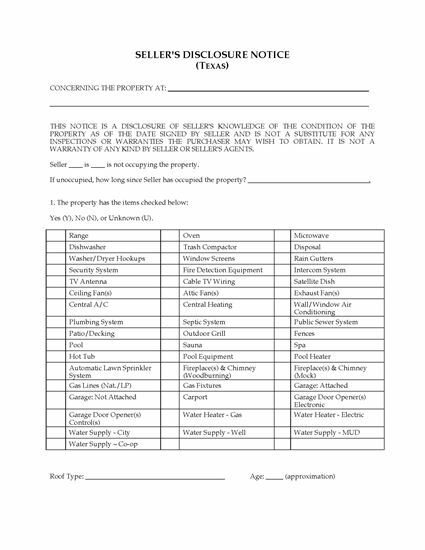 This Texas Seller's Disclosure Notice form is available as a MS Word download, and can be easily filled in with your specific information.